Brand New Boxed Item From A Fully Functioning Shop – MG Domestic (Hyde). All Prices Include VAT. Featuring a turbo grill that tilts for easy cleaning, a favourite option that allows you to store up to 10 or the most used function for quick use. The iXelium coating maintains the original shine for longer which makes the oven highly resistant to scratches and much easier to clean. 6th Sense technology offers 30 pre-set frequently cooked recipes developed in collaboration with chefs. The setup of ideal cooking parameters for each recipe and the recipes book provided with the oven ensure outstanding cooking results. Some dishes must be turned or stirred half-way through the cooking time to get the best results. The oven will emit an acoustic signal to remind you. When cooking pizza you can even place two different shelves in the oven. Spend less time cleaning and more time cooking with easy clean catalytic liners. Grease and dirt gather in the cavity which is then burnt off or oxidised when the oven heats up to around 200°c. Two telescopic shelf offers a smart and safe way to access your food when cooking. Smooth sliding shelves offer a stable platform to add and remove dishes which can support heavy dishes when fully extended. Rest assured safety is at the heart of this products with a built in electronic child lock and quadruple glazed door making it cool to touch prevent any potential accidents. The Whirlpool AKZM 694/IXL Fusion built-in oven with features for your convenience and a stylish finish to complete any kitchen. Select one of 30 pre-set recipes, and your oven will automatically adjust cooking, temperature and time settings, while continually monitoring your dishes, to ensure perfect results. The Ready2Cook function uses a powerful convection system to quickly reach the right temperature, and completely eliminate the need for pre-heating. With the innovative Cook3 function, you can cook up to three separate dishes at the same time, without the risk of aromas mixing. LCD TEXT ASSISTED – FULL TOUCH. An intuitive, full touch user interface featuring 6 traditional functions, 14 special functions and 30 automatic programs with an online step by step cookbook. You can also save up to 10 of your favourite recipes, for added convenience. The Multifunction 8 feature offers flexible cooking options, to ensure perfect results, whatever the recipe. The revolutionary iXelium nanotechnology treatment protects your oven from scratches and ensures a perfect shine, always. And it’s easy to clean: all you need is water and a soft cloth. Thanks to slow-closing hinges, the oven door shuts effortlessly, with a soft and silent motion. To clean your oven, simply use warm water and a soft cloth, no need to use harsh chemicals or cleaners. This Whirlpool oven features soft-sliding shelves, for increased ease of use. All the space you need. 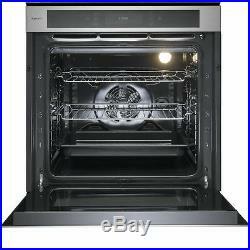 The XXL cavity in your oven has a capacity of 75 litres with 5 different shelf positions available. Usable volume (of cavity) – NEW (2010/30/EC). Energy efficiency class – NEW (2010/30/EC). Energy consumption per cycle forced air convection – NEW (2010/30/EC). Energy consumption per cycle conventional – NEW (2010/30/EC). Depth of the product. Length of electrical supply cord (cm). Height of the product. Depth of the packed product. Width of the product. Height of the packed product. Width of the packed product. The item “Whirlpool Fusion AKZM694/IXL Stainless Steel Built In Electric Single Oven NEW” is in sale since Saturday, May 6, 2017. 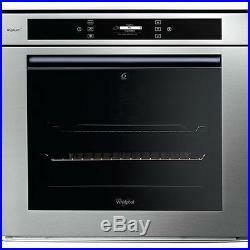 This item is in the category “Home, Furniture & DIY\Appliances\Cookers, Ovens & Hobs\Ovens”. 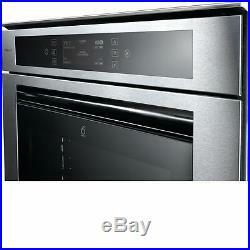 The seller is “mgdomesticonline” and is located in Hyde, Greater Manchester. This item can be shipped to United Kingdom.